I read Gemina by Jay Kristoff and Amie Kaufman a little while ago so hopefully I remember what happened. I REALLY enjoyed this book though so I wanted to do a review of it but then I thought hey, why not do something different. So I am doing a ‘chat’ where we can talk about what we thought of the book, hopefully you all get involved and leave me lots of comments with your thoughts so it isn’t a total fail. 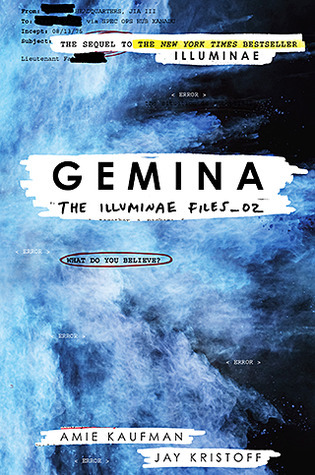 Gemina is the sequel to Illuminae (review here). Ok so going into Gemina I was just hoping it would live up to Illuminae which was such a good book. I shouldn’t have been afraid, Gemina was amazing. Here are some of my immediate thoughts taken from my goodreads review. Oh my gosh this was amazing, as with Illuminae I couldn’t put it down and I loved the little tricks they pulled. I think Gemina relied a lot more on character/setting development and a well formed plot purely because it wasn’t as new and exciting but it was done so well. I didn’t like the concept as much as I did Illuminae but I loved the characters in Gemina so much more than the ones in Illuminae. Nik and Ella were the best. I also liked the details and how the creatures were so well thought out an how everything tied together really well. I really enjoyed the reappearance of some familiar faces but I didn’t really care that much about them. I don’t want this series to be just a trilogy… and that cliff hanger… wow I need the next book. I’m going to make a prediction that it’s cover will be a silvery white with black because I feel like any other colour is going to be too similar to the other two (yellow, red, pink, purple etc.) I guess it could be green…. but silver would be so cool. good, onto more thoughts on the book. Honestly I didn’t find the plot twist as surprising this time. As if Nik was going to be dead. I was confused as to how, but once they started talking about the worm hole causing weird things to happen I was pretty convinced that was what had happened. Also Ella… I don’t care if they wanted dramatic impact, she shouldn’t have dropped off the grid. I didn’t realise how much I liked her until she wasn’t there. Plus we never really found out what was going on with her an her friend, any guesses people? Hopefully we’ll find out in the CONCLUSION to the trilogy. I tried to type that in lowercase, I really did but WOW I am not ready for the series to end. I really liked the worm creatures and how they were so thought out. They even had a wikipedia page, and they tied in so well with the story considering they were the reason Nik and Hanna. I want more clever world building like that which actually feels REAL. I can honestly believe that they exist somewhere out there in space waiting to get us. I also really enjoyed the strike team who became their own characters. I picked ones that I was backing based on their call signs (which by the way I really want to incorporate into a novel) and most of them ended up dying off pretty early, but meh. I also liked how AIDAN was added in just as a little nod to the first book and a character that we all loved. I don’t really know how discussions work, but I’m interested in hearing about what you thought of the characters? The worldbuilding? The plot? Final question: what colour do you think the cover of the third book will be? I’m not bothered by the cover, I just want the story and the characters to be as great as they were in Gemina! I was hesitant to pick up Gemina after my disappointment with Illuminae but I loved it so much, especially Marie Lu’s illustrations and all the smaller details that were scattered across a lot of the pages – I got a kick out of seeing the names of other YA authors on memos, lists of victims, etc. Ahh yes Marie Lu’s illustrations were amazing. And yes there was just so much detail in there.